I really like creamy dressings every so often even though my favorite is a traditional Italian dressing. Creamy Italian has to be made fresh and flavorful. 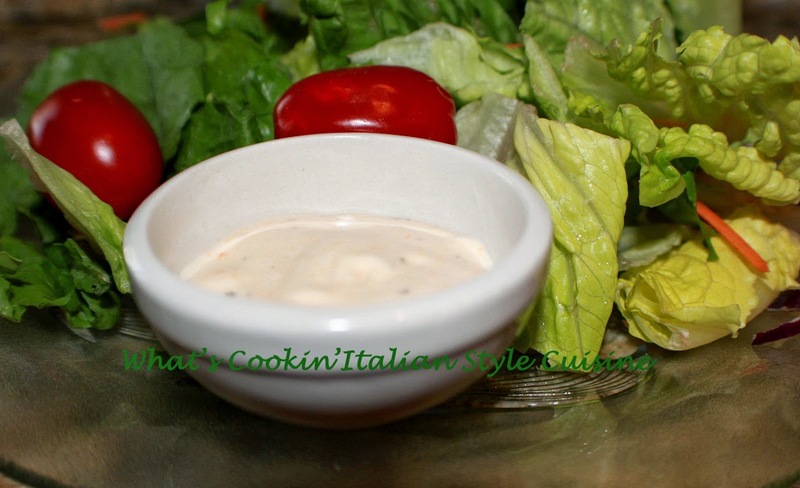 This is a creamy Italian Parmesan style dressing that really has makes salad come to a full meal when you add your favorite topping. I listed some of mine at the end to make your salad a full meal. With the nicer weather this truly is my go to meal. It also travels well to work and keeps me from being hungry longer. I try not to add more than 2 tablespoons of dressing in a small container to keep down the calories. Try this as a dip for your favorite vegetables or top your salad with grilled chicken. This dressing will compliment just about any kind of meat or seafood you want to add on top! Mix all together and let flavors blend at least 3 hours before serving. Pour over Romaine lettuce using your favorite salad additions, see below for suggestions.